The 1925 New York Yankees season was the team's 23rd season in New York and its 25th overall. The team finished with a record of 69–85, in 7th place, 30 games behind the Washington Senators. New York was managed by Miller Huggins. The Yankees played at Yankee Stadium. All members of this team are now deceased. This season was marred by Babe Ruth's infamous "stomach ache" that kept him out a good portion of the season. It was the club's lowest finish, in both percentage and place in the standings, since their 7th-place finish in 1913. It was also the first time they had finished below .500 since 1918. The Yankees would regroup and it would be 40 years before they would finish below .500 again. 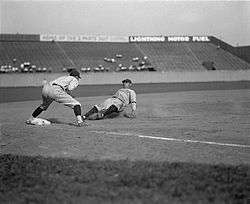 Babe Ruth sliding into third base at Griffith Stadium in Washington, D.C., on June 23, 1925. Washington Senators third baseman Ossie Bluege looks on. May 1925: Oscar Roettger and players to be named later were traded by the Yankees to the St. Paul Saints for Mark Koenig. The Yankees completed the deal by sending Fred Hofmann to the Saints on May 15 and Ernie Johnson to the Saints on October 28.